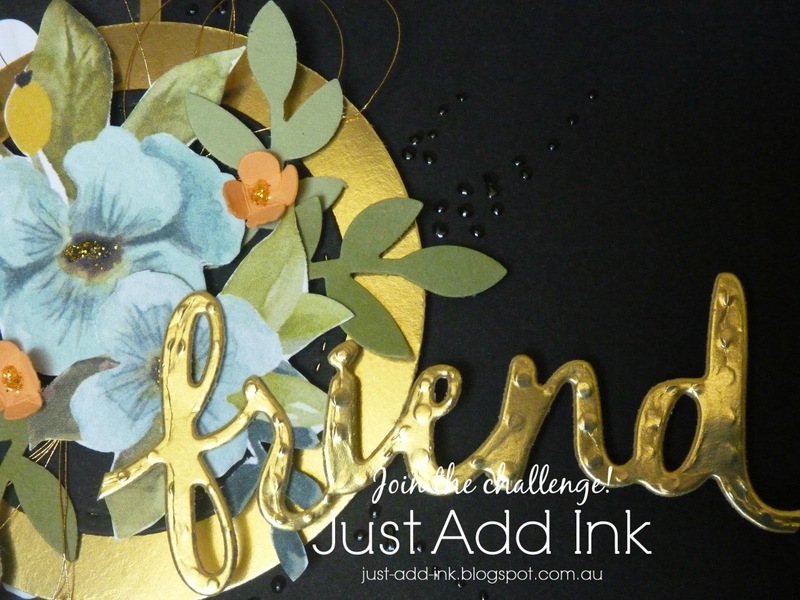 It's Just Add Ink challenge time again and this week the lovely Kelly has given us some fun summery inspiration to play with. 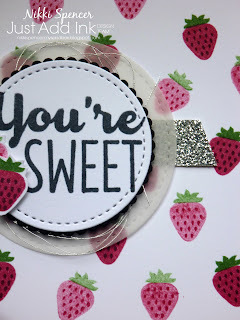 I've gone a bit literal and used the sweet little strawberry from the "Cool Treats" set and a whole lot of stamping to create my own dsp. The colours l've used are Rose Red first and second generations to get the shades and the same with Garden Green for the tops. I also used Fresh Fig for the seeds on the darker berries and straight Rose Red on the 2nd generation berries. 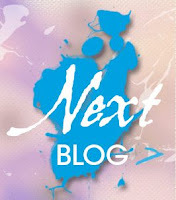 The design team have created some stunning projects using the inspiration, so click on the link above and take a peek! 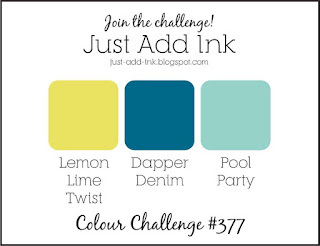 Time for another lovely colour challenge over at Colour INKspiration. 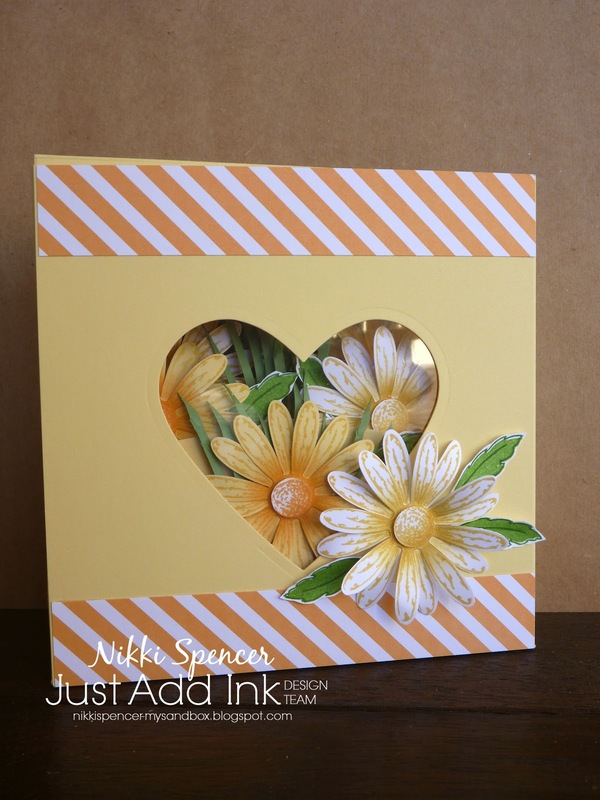 I love this soft and pretty palette and it was lovely to create with. I have used the "Painted Harvest" set to create a generic card this week and if l do say so myself, l'm pretty happy with the effect. 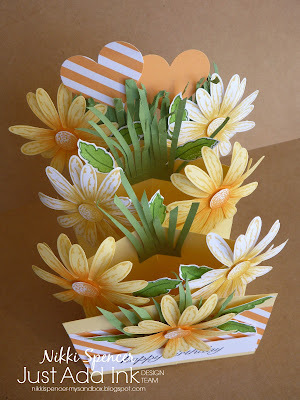 Have you just arrived here from the lovely and uber talented Jackie Aitken and her fabulous 3D creation? 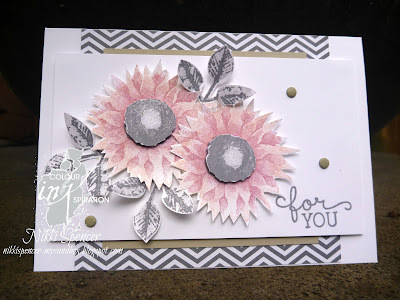 If not, you can continue on the blog hop loop by clicking the next banner below and that will take you full circle to Jackie so you can see all of the gorgeous design team creations or you can click on the Colour INKspiration banner or link above and start at the top. Next on the hop is my lovely and talented friend Patrice Easton, follow the hop to see here pretty creation. It's time for a new Just Add Ink challenge and this week Di has challenged us to "Add Texture" to our projects. My texture elements are the Woodgrain (retired) embossing folder and some silver glimmer paper. I have combined these with some pretty dsp (retired). 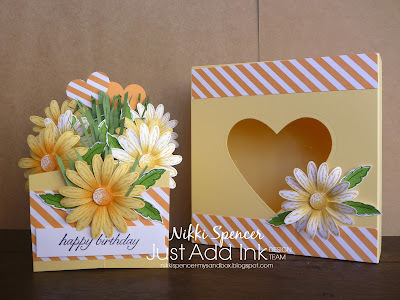 I'm on a mission to use up lots of my dsp stash that's taking up space that l need for new designs...self confessed paper hoarder here...:0) So you may see a few retired dsp projects coming up! 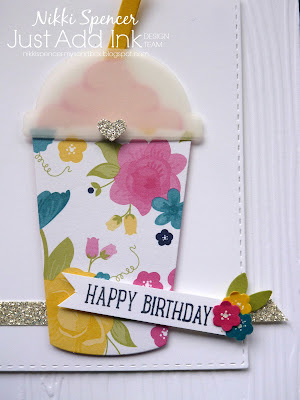 Coffee Cafe....Love it! 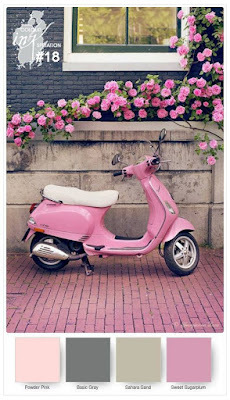 I can't believe l was so slow to the party on this baby, it's really cool! I've been having lots of fun playing with this set/bundle, it really is very versatile for all genders. 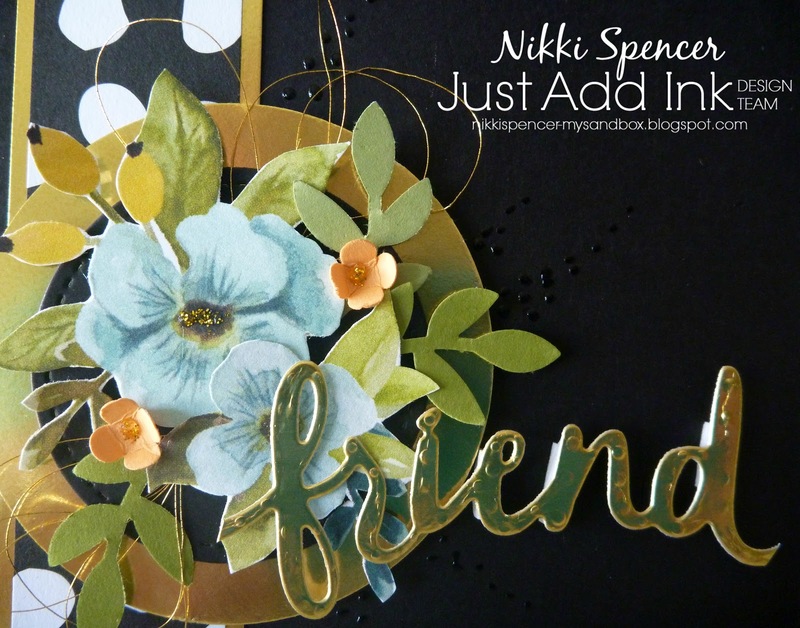 The design team have created some fab textural projects, so don't forget to click the Just Add Ink link above and go take a peek at those. 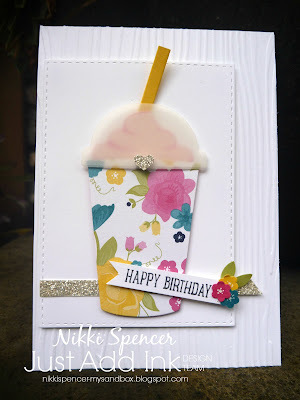 All supplies used are Stampin Up! unless noted. OK, I'm officially done with this miserable Melbourne weather....I know it's good for the catchments etc...But Geez, enough already! Anyone else ready to pack up and head north to warmer climates? OK, I'll stop moaning now and get on with the reason I'm posting. 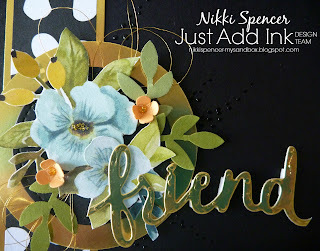 This week over at Just Add Ink we have a fun colour combo from Rochelle. 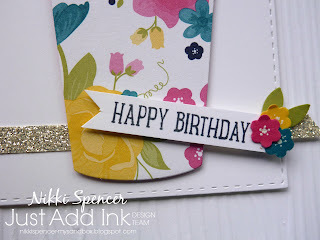 I'm loving these colour together, LLT is a big fave, but it's a real pain to photograph...or is it just me..Hmmm! With the release of the new Stampin Up Holiday catelogue, l was a bit excited to see this pretty bauble set "Seasons of Whimsy" as a hostess set. 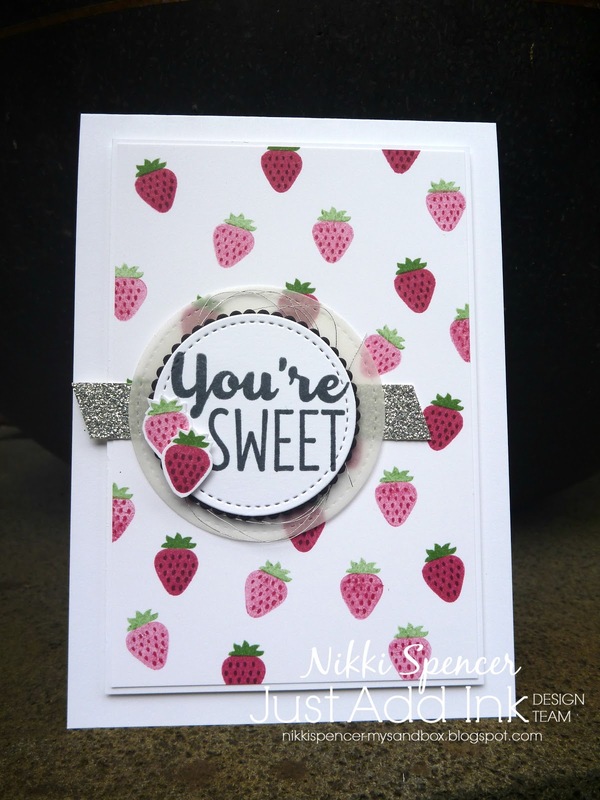 It was lovely to stamp with having such fine lines and detail and the fine sentiment font is really pretty too! You can see better in the first pic all of the sparkly detail. 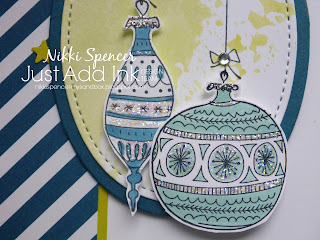 I used some silver detail on the bauble caps and the rest got a very sparkly dose of dazzling details. 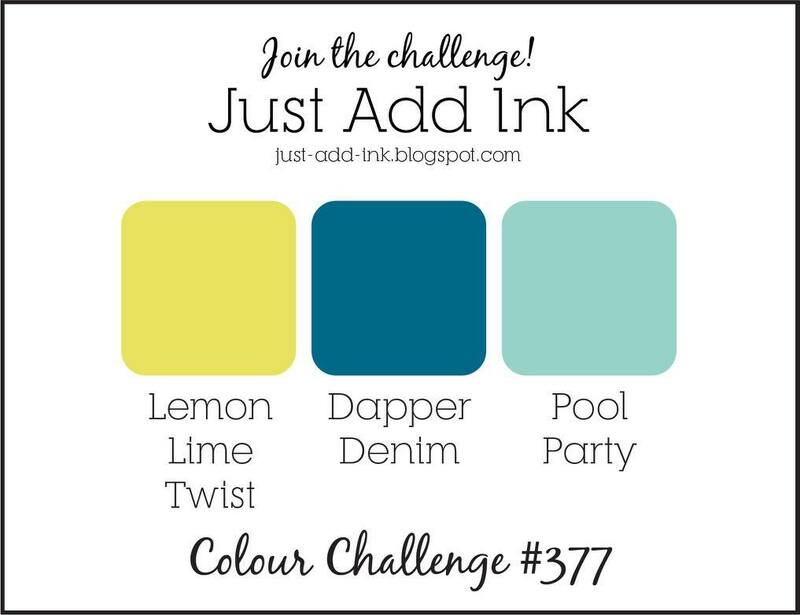 The JAI girls have some gorgeous inspiration using these colours, so click the link and check them out! 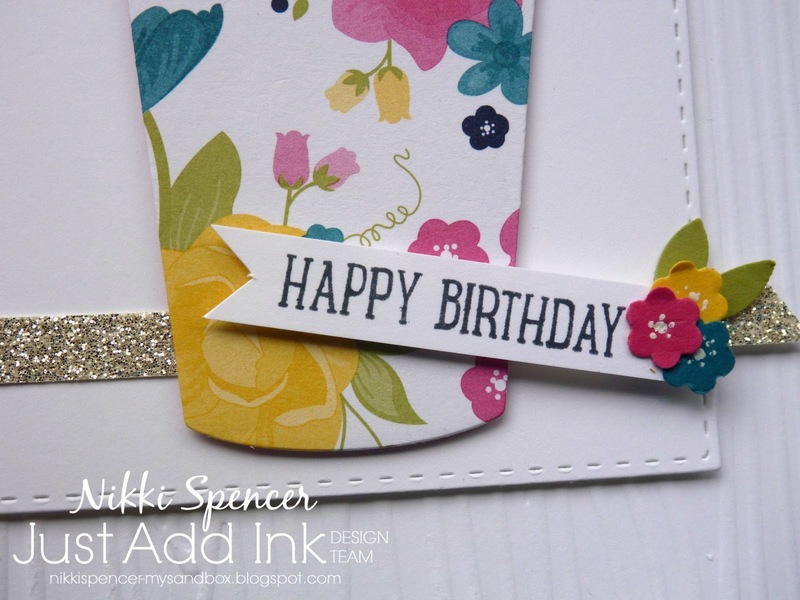 Time to share another lovely colour combination from Colour Inkspiration. 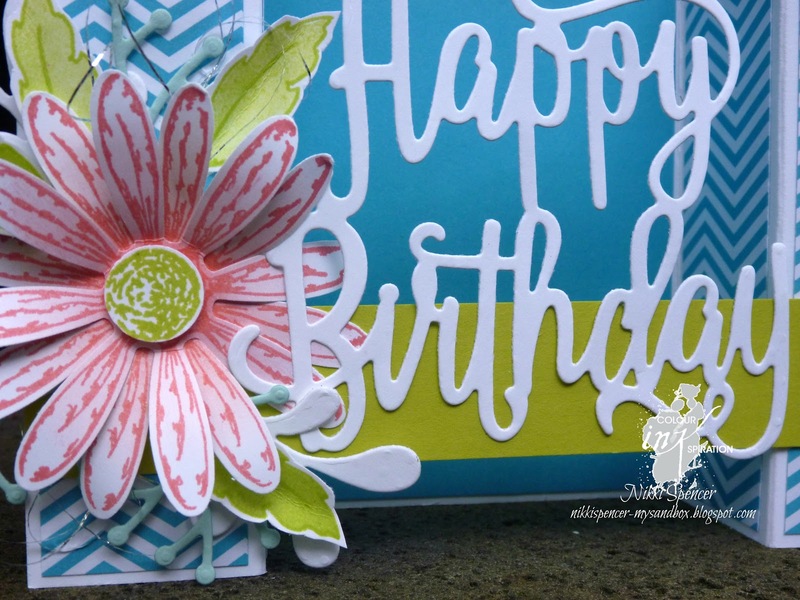 These colours together are such a cheery palette and l had fun creating with them. 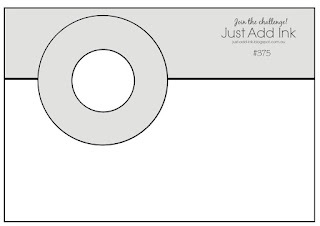 I decided to have a go at the current trend of "Bridge Fold" cards. 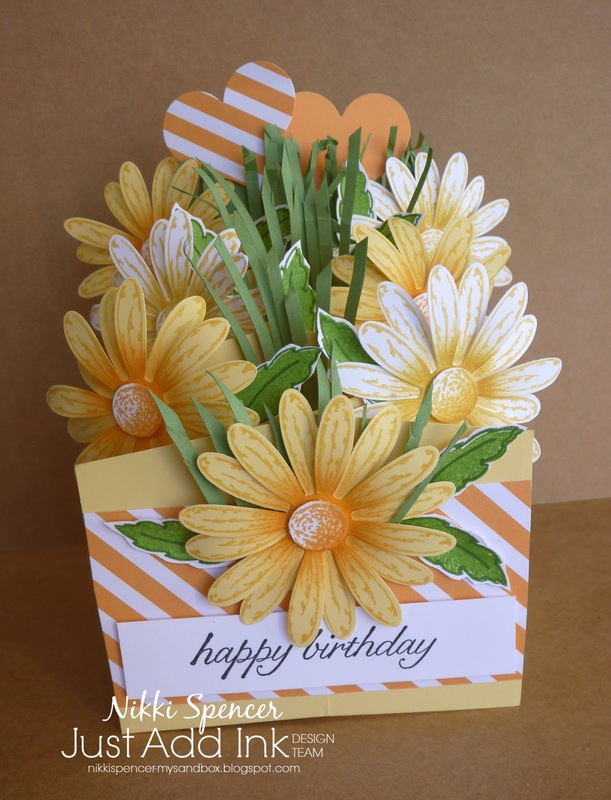 Along with the colours I've teamed it with the Daisy Delight bundle and Happy Birthday thinlit. This was fun! 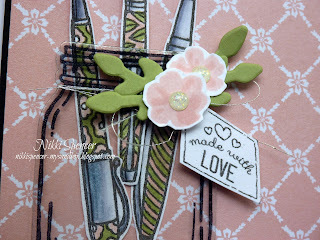 If you have just landed here from the "Ahhmazing" creation from the lovely Jackie Aitken, you can continue on the hop by clicking the Next banner below or you can click the Colour Inkspiration link or banner above to go directly to the Facebook page to see all of the fabulous creations from the crew. 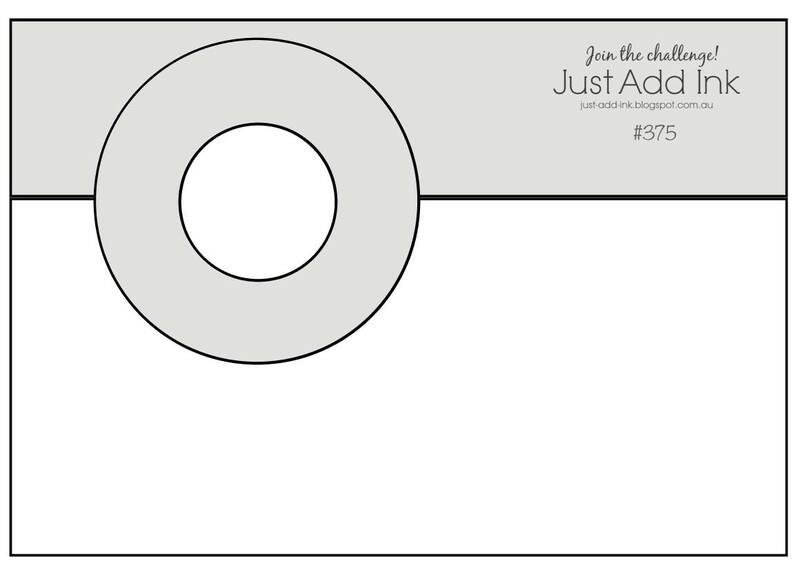 Here's the cardstock & scoring info for this size. Base: 8" x 4-1/8" Scored @ 1-1/4" - 2-1/2" - 5-1/2" - 6-3/4"
Next on the hop is the lovely and talented Rose Packer and her inspiring project! Just Add Ink #376...Just Add "D"
Its time for new Just Add Ink challenge and this week Tina has suggested we all use a "D" element on our projects. 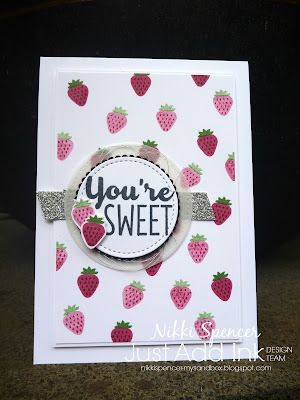 Something a little different from me this week! The timing for me on this challenge was perfect, as l had been asked by a friend to create a "Special" Birthday card for her Nan. 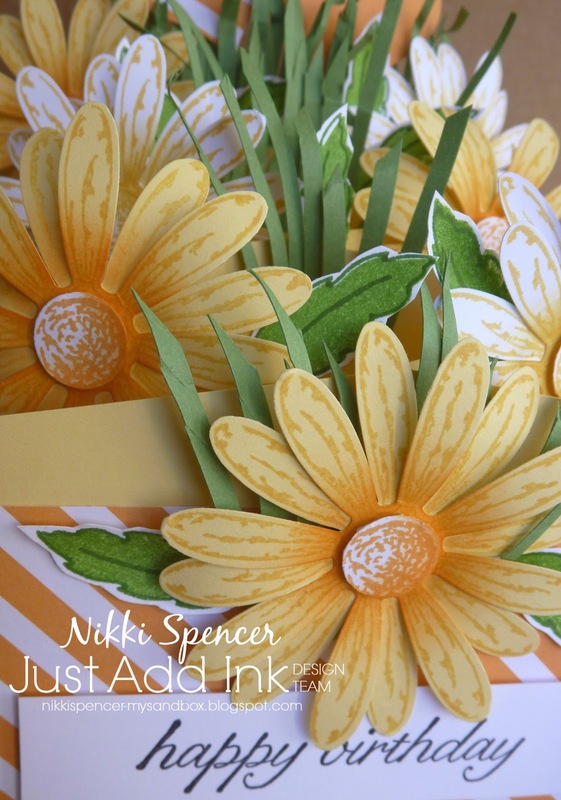 The prerequisites were "Yellow & Daisies" being her fave colour and flower. 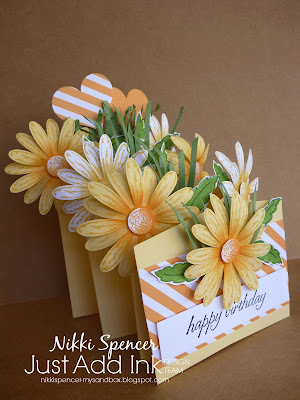 A perfect project for giving my "Daisy Delight" bundle a workout and attempting a "Cascading" card. If you google "Cascading card" there are heaps of tutorials, but just be aware that the one you are using works with the cardstock size for your region. The colours l've used are Whisper White, So Saffron, Peekaboo Peach &Gumball Green. 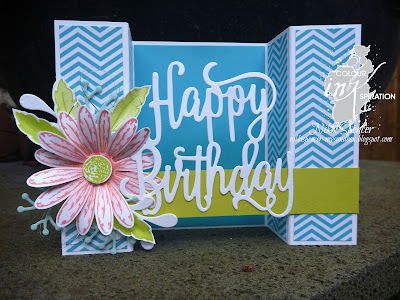 And of course a special card needs a special form of delivery! 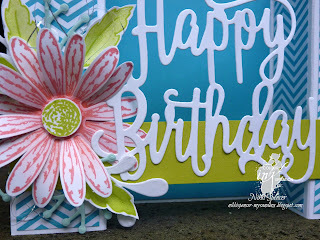 Don't forget to pop over to the challenge blog to check out the fab array of "D" projects from the design team. Hey there! 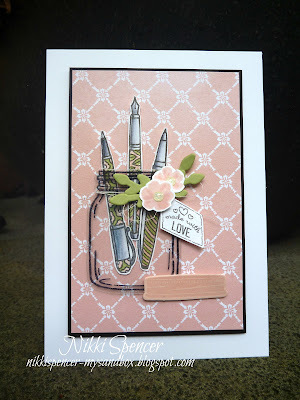 We have a new hop happening over at Stamp Review Crew For this one we are showcasing the versatility of the "Crafting Forever" stamp set. SRC hops run fortnightly and showcase a different set for each hop. We are a large group of International Stampin Up! demonstrators, that love to share our projects. 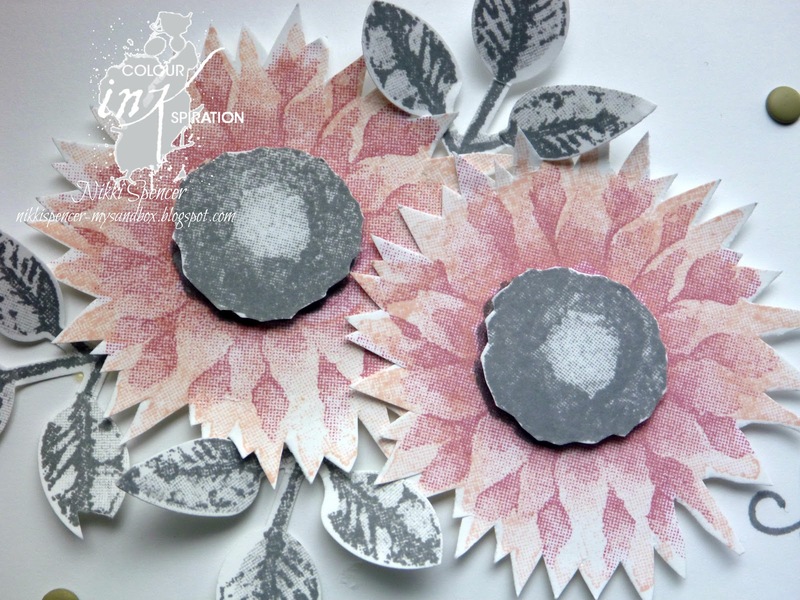 Did you just arrive here from the fabulous talents of Tanya Boser and her fab project? If not, you can click on her link and go take a peek or click the "Next" link below to continue the hop in a loop. 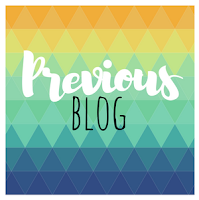 If you get lost or stuck on the way, you can click the "Stamp Review Crew" banner on each design team members page to be redirected to the SRC blog, where you will find all the links. 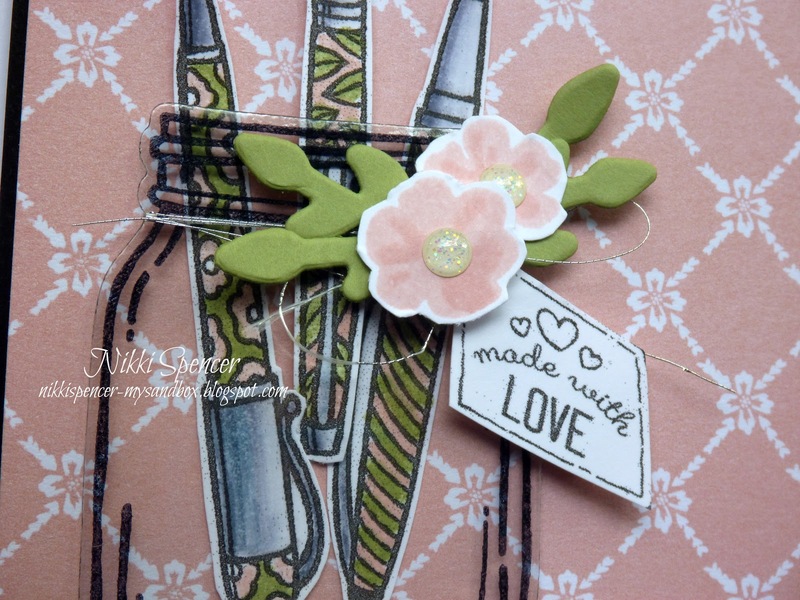 I've chosen to combine this set with my unloved "Jar of Love" bundle, some Powder Pink & pear Pizzazz pastels and kept it simple. 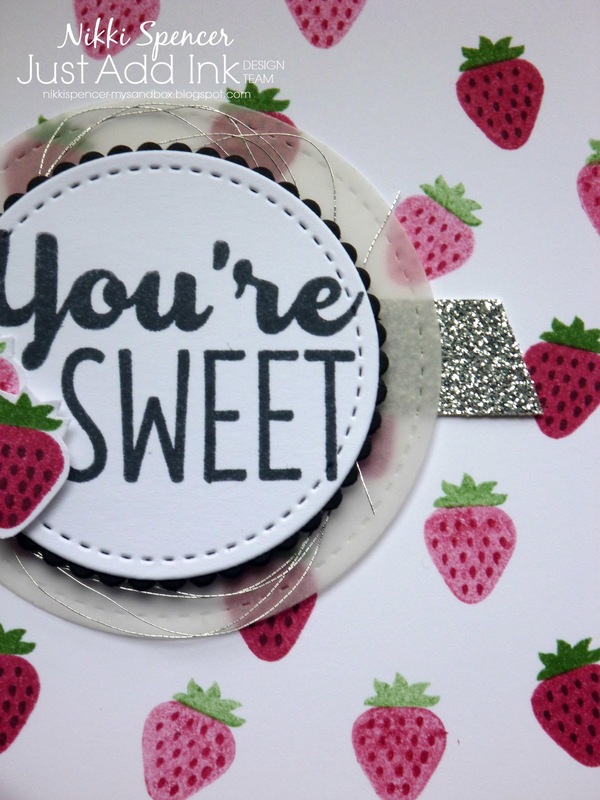 To create the lid, l stamped the image using Versamark & clear embossing powder before die cutting. 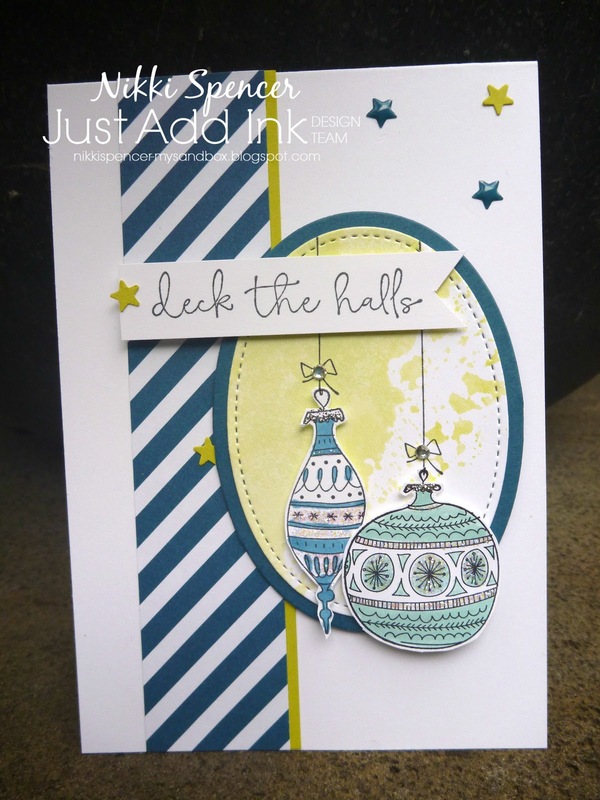 To keep hopping, click the next link and head over to see what fabulous creation Martha Inchley has created! 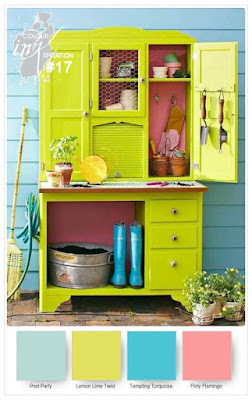 Woohoo!....The first day of spring in the land downunder! I am one happy camper, as Summer is a coming! 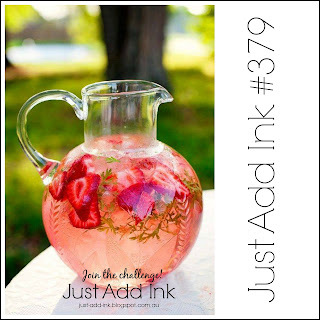 It's also Friday and that means we have a brand new Just Add Ink challenge happening! 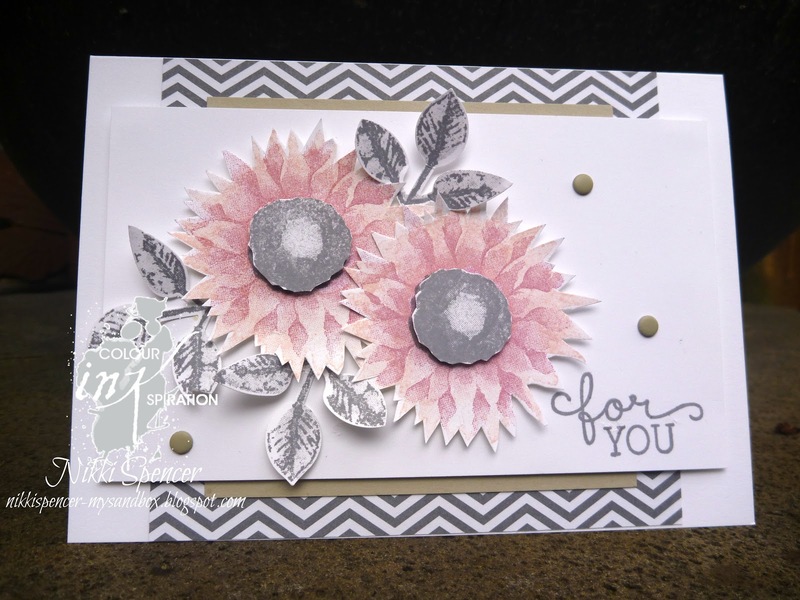 Kim has given us this fun sketch to create with this week and the possibilities are endless. For my take on the sketch, l've once again used the gorgeous "Whole Lot of Lovely" dsp, added in some gold foil & twine, some more fussy cutting and a partial use of one of the "Lovely Inside & Out" thinlits. 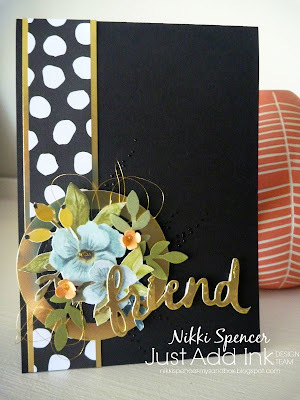 I have also used the fine tip glue pen to add some little speckles on the black cardbase. 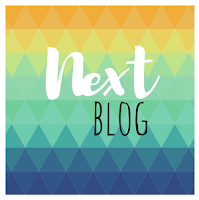 The rest of the team have created some stunning projects, so pop over to the challenge blog and be inspired!